Merritt Island is a beautiful area located along the central Atlantic coast between Cocoa and Cocoa Beach. This area is known as Florida’s “Space Coast", home of the Space Shuttle and the Atlas, Delta, and Titan rockets. 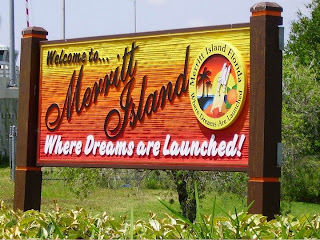 Visitors to Merritt Island are only minutes from the ocean. They can spend the day swimming or searching for seashells along the miles of white beaches. Other activities include surfing, water-skiing, wind surfing, snorkeling, boating or sailing. Boats are available to rent for deep-sea fishing, or there are many piers to fish from in various parks around the island. The famous Cocoa Beach Pier is nearby as well.For those who do not want to go to the beach, there is golf, tennis, horseback riding, hiking, biking, and shopping. Historic Cocoa Village is close by and has attractive, tree-lined streets full of shops, cafes and art galleries.There are many attractions nearby, including Kennedy Space Center, Astronaut Hall of Fame, Police Hall of Fame, Veteran's Memorial Center, and much more. The many parks in Merritt Island offer amenities such as pavilions, picnic tables and barbeque grills to have a family cookout or birthday party. There are also beautiful playgrounds for the kids to enjoy. Go to Brevard Parks and Recreation for a full listing. The Merritt Island National Wildlife Refuge is adjacent to the Kennedy Space Center and occupies land managed by the U.S. Government. A 22-square mile wetlands area, it is home to over 300 species of birds. Other residents in the refuge include ghost crabs, loggerhead and green sea turtles, reptiles, raccoons and bobcats.Visit the Blackpoint Wildlife Drive, a seven mile, one-way road, that will provide you with views of many of the animals mentioned above. Numbered stops along the drive correspond to numbered paragraphs in a leaflet you can pick up. For more information on the Merritt Island National Wildlife Refuge click here.